Written in response to the Alias annual gathering event, Moving Forward and Staying the Same: Artist Led Evolutions, AirSpace Gallery co-director Glen Stoker considers the continued importance of artist-led activity to the UK's visual arts ecology. As AirSpace Gallery enters its ninth year of artist-led activity, we are in the midst of a regular phase of self-reflection and organisational review. So it was timely then, ahead of an imminent ACE Grants for the Arts bid for our next three-year programme, to discover the Alias annual gathering event, Moving Forward and Staying the Same: Artist Led Evolutions. 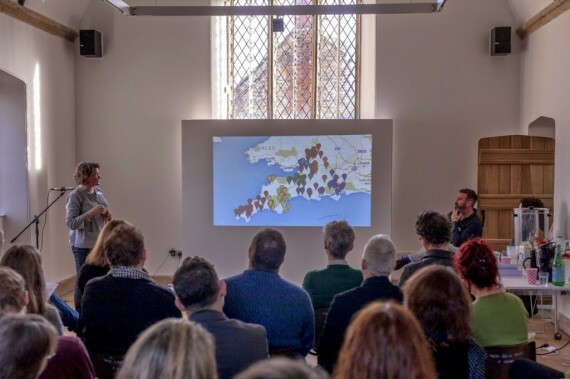 Held at OSR Project Space in West Coker late last month, ten invited artists and speakers and an audience of over 50 artists and artist-led representatives from the South West considered the future for the artist led. Artist-led initiatives are crucial to the overall success of the country’s visual arts – they offer an alternative to the institutional. Well over 100 such organisations, some funded, some not, are in operation in the UK today, offering distinctive and diverse, independent, ambitious, experimental and challenging visual arts programming. At the same time they create opportunities for each year’s hundreds of new visual arts graduates, early and mid-career artists, enabling them to make, test and exhibit new works. Without this artist-led activity, the country’s visual art landscape would be somewhat one-dimensional. Yet despite their importance, artist-led initiatives are often unrecognised and under-rewarded in the palaces of power. High quality programmes are delivered critically and with enthusiasm, but often for little or no financial remittance and regularly at the expense of personal arts practices. And with the prospect of harsher economic times to come for the arts, it was clear from the day’s talks that artists will have to become ever more resourceful and self-sufficient in how they proceed. The first panel discussion looked at mentoring/organisational review and its ability to help, offer support and allow an organisation to assess its strengths and weaknesses. Funding streams were explored – such as a-n bursaries – which could facilitate the objectivity one gets from a professional independent outsider. It was interesting to hear it suggested that we look outside the arts for mentoring – towards the business sector for example, particularly in the area of funding and organisational set-up. Tellingly, though, there was an emphasis on the effectiveness of peer-to-peer mentoring, cross-organisational support and a sense of artist-led union and co-advocacy. This can be done with less expense but can have added value when considering the advantages of fraternal networking and peer and network strengthening. Nick Davies’ and Sovay Berriman’s inventive, satirical, retro-active artist-led runaround game, Blue Sky / Brown Mud – developed in response to Davies’ commissioned print of the same name – nicely fed into the afternoon’s panel discussion and an examination of the artist-led’s impact upon, and responsibility within, the wider visual arts sector and the wider cultural context in which it works. A wide-ranging discussion invoked healthy contribution and debate from the floor, on issues such as gentrification, access to disused space, public support and a lack of funding. However, for me, the interest lay in questions such as: what is the job of artist-led activity? To whom is it responsible? Does the presence of some public funding affect the independence of an artist-led space or can it still be provocative and playful? How much should the public be considered when devising a programme? And at what point does the artist-led become institutionalised in its organisational processes? Of course, there are no easy answers, and certainly none were settled on the day. It is clearly a matter of individual context. For instance, a space in London or, say, a city like Bristol which has a mature institutional core-funded arts sector, allows for that more playful artist-led-as-agitator space. In such places, the public can access the content on the artists’ terms. However, in a city less culturally endowed or mature such as Stoke-on-Trent, the waters are muddied a little. AirSpace Gallery, still operating as the only contemporary art gallery in a county of over a million people, has to consider its output and responsibilities a little more carefully. There is a sense of implied institutionalism to that status which means that the balance between audience and artist has to be a little more equal. In truth, the whole day could have been given over to discussing this area, though at its conclusion there was a palpable sense that the audience were left with good food for thought. Moving Forward and Staying the Same: Artist Led Evolutions was a well produced, informal but serious examination of some pertinent contemporary issues. Through its network of artist-led groups, individual artists, curators and visual arts professionals, Alias has been supporting the artist-led community in the South West, through peer-to-peer mentoring, advisory services and artist development, for 15 years. Yet despite such long-standing experience, it was instructive to see an organisation not resting on its laurels. This public facing event was creatively formatted to simultaneously allow Alias a chance to take stock and consider the continued relevance of its own programme, while offering invaluable professional and developmental discourse for its constituents, a sense of fraternity and support, and some possibilities for solving some of the many challenges facing us. This is an edited version of a longer piece originally published on the AirSpace Gallery blog.